Music for Maniacs: ALBUM DU JOUR #5: IT'S A HIPPIE FREAKOUT!! Pneumershonic is a crazy old guy named Paul and his pal Matt. 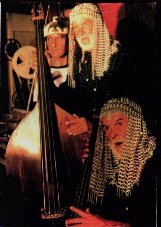 These New Hampshire-ites recorded an album in 1997 called "Frequencies of the Beast," a very entertaining collection of Paul's improvised singing/rants like "Hippie Freakout" and "Martian Girlfriend" over Matt's music. Matt wrote to me asking to link to an article written about them on WFMU's Beware of the Blog, but I wasn't going to do that cuz, well, it's already on Beware of the Blog, so why bother? But the article is 6 years old, it's an album that any outsider music fan should check out, AND he said he'd send me (and you) a CD. So I reconsidered. And it's got marimbas! And optigans!